I think most of us have in some way or another been touched by addiction and have thus experienced the hurt that comes with it. I have struggled with addiction and also been hurt by others who have struggled with addictions. No matter how addiction affects you today, remember that Jesus Christ is the only one who forgives all your iniquity, heals all your diseases, redeems your life from the pit, crowns you with steadfast love and mercy, and satisfies you with good so that your youth is renewed like the eagle’s. We are never too far gone or too far in the pit for God to reach in and lift us right out. He will always rescue us as soon as we cry out to Him in faith! Praise God as you listen to the song today that He is the Great Physician, the One Who sees us right where we are, and the One Who loves us in our brokenness. God is not indifferent to what is going on in your life or the lives of those you love! He wants to heal you and He wants to heal your family member or friend who has an addiction. Never give up hope that they can be rescued from the pit. We are not always aware of our addictions, and we are not always aware if we are enabling or contributing to the addictions of others. Ask the Lord today to show you if there is anything in your life in relation to addiction that He wants you to be aware of. Pray for deliverance from this sickness for someone who has hurt you in some way as a result of their own addiction. And ask the Lord to help you see those who struggle with addictions the way He sees them so that you can love them as He does. Reminder: Listen with no distraction to the music video. I have included two songs today. One may be a little outside of what you are used to, but I hope that you will listen to the lyrics since they are very relatable. Additionally, Surrounded: This Is How I Fight My Battles is an anthem that is good to remember in your spirit each and every day. It may look like you’re surrounded, but you’re surrounded by Him! Let’s face it – family can be challenging. Even on our worst days, my family is pretty amazing. I am so blessed to have some of my family members also as my best friends. It is not always like that now and it definitely has not always been that way. God has healed my family in many ways over the last several years and given us the desire to be healthy individuals and in turn our relationships with each other have become much healthier. But there are still times of difficulty. And there are some family members I have to spend a little less time with than others to maintain my sanity. Honestly, when I am having a conflict with a family member, I tend to avoid them and the thought of them altogether. And then there’s the pain of losing a family member. I lost my oldest sister a few years ago, she was killed in a car accident and this type of pain feels unbearable. There are still days I think of her and find it tough to breathe. Brokenness in our families comes in all forms. We all have it and it hurts. When I was reading Job recently, something that jumped out at me was that he would rise early in the morning and offer burnt offerings on behalf of each of his children in case they had sinned. Later, his whole family died and I can’t imagine that level of suffering or pain, but I think what touched my heart about it was how much Job must have loved his family to have prayed like that for them every day. I want to love my family that much, even the ones I don’t like a whole lot. What better way to worship in our families than to pray for each other? Set aside 10 minutes today to pray for each of your family members by name, even the ones you don’t necessarily like – especially the ones you don’t necessarily like. As you pray for them, however God leads you to pray otherwise, give praise to God for them, thank Him for them and ask Him how you can love them better. Reminder: Listen with no distraction to the music video. Time and time again I get to that place, and then a new struggle, temptation, or hardship comes up and my mind goes haywire. I get stuck in trying to think about how to handle it or what to do or how to fix it. My mind races and I just completely wear myself out. I feel like Paul did when he said, “I want to do what is right, but I don’t do it.” I know the right thing to do is renew my mind, focus on God, not my circumstances, but it is a lot easier said than done. I don’t want to take away from the significance of spending time in God’s Word every day to renew the mind, but I do want to point out that there are more ways to do so. I have found that worship music is a great way to do this as well. Kari Jobe is my all time favorite worship singer because her music focuses on God and His character and they include a plethora of scriptural truths. When I get to that place in which my thoughts are spinning out of control, I have a go-to playlist that I listen to that I entitled ‘Worship’. It helps me to renew my mind; to trade in Satan’s lies for God’s truth in moments that I can’t necessarily read or study the Bible. God has used this to help me ‘take captive every thought and make it obedient to Christ’ and to ‘be still and know that He is God’. I have included two songs today. Much like life often is, life can be heavy. While I believe firmly in the importance and healing power of grief and tears, I also think it is dangerous to dwell in that place. Sometimes it is good to just lighten up the mood with some upbeat worship music! Create your own playlist called ‘Worship’ that consists of songs that help you take captive your thoughts and to be still and know that He is God. Reminder: Listen with no distraction to the music videos. One of the hardest things in my life is being open about my flaws. I am a perfectionist and even as I have written this devotional, I have struggled. I want everything to be just right and I don’t ever want to look like I don’t have it all together. I can acknowledge where some of these tendencies come from but it certainly does not fix it quickly. There is a lot of damage to my heart and just to be open and honest about it, I don’t want to open my heart up much of the time. I am extremely selective about who I am open with. I want to keep it protected and safe and comfortable and that’s that. But I think I miss out on so much by keeping it that way, and I don’t believe that’s how God intended for it to be. I know from Genesis 2 that God does not desire for us to be alone – He created us with relationship in mind, first with Him and second with others. To have healthy relationships, being open and honest is mandatory, first with God, and then with others. I believe the best place to start is being open and honest with God. It builds trust with Him to just talk to Him about everything, even the unpleasant stuff. He does not always talk back, usually doesn’t, but just verbalizing things to Him is such a relief. It is also essential to have people we can share with and talk to this way. People are imperfect and they will not always accept everything we say or do the way that God does, but I think if we start small and become intentional about being open, we can learn that opening ourselves up to others isn’t as detrimental as we might think. 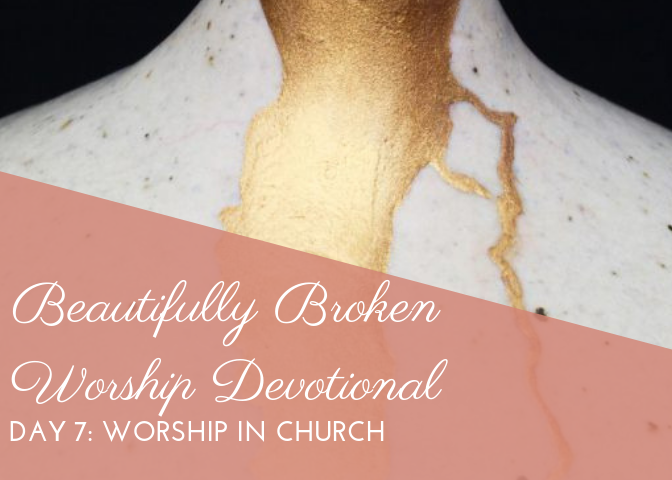 This is a challenge I face on a regular basis and I have included a song today that reminds me that I am allowed to be, and supposed to be, broken. There is no reason to hide it or try to cover it up or try to appear to be something other than that. I hope it helps you today to be reminded of that, too.